Old Pasadena is a 22-block historical area known worldwide as a fun getaway for shoppers and diners visiting Southern California. 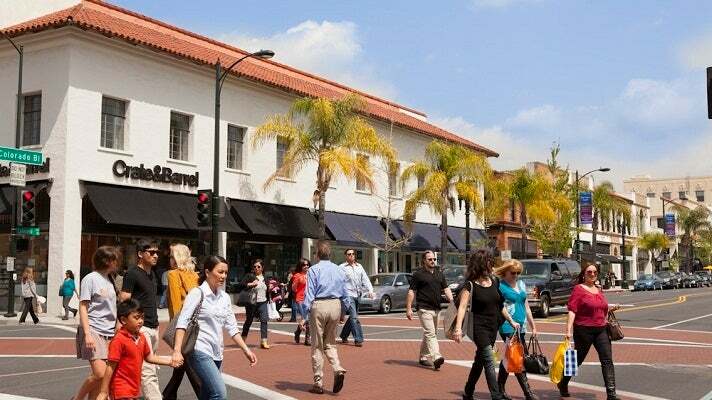 The area is filled with turn-of-the-century Victorian, Mission Revival and Art Deco buildings that have been renovated to offer more than 200 dazzling retail stores, art galleries, boutiques, antique shops, restaurants and bars. Stroll down quaint alleyways or duck into one of the airy European-style piazzas to explore some of Old Pasadena's best dining, nightlife and shopping. Whether you're looking for a date night outfit or an addition to your living room decor, Old Pasadena offers a variety of shops, from apparel to housewares. Local boutiques like Veronica M. share sidewalks with the best in national brands, including H&M and Banana Republic. Nestled in the heart of Old Pasadena, One Colorado is a creative square where 19th-century architecture meets superlative shopping, elegant al fresco dining, live music and art events. Find fashion staples at essential national retailers like the Gap, Kate Spade and Juicy Couture, or discover a new favorite designer at boutiques like Elisa B. Old Pasadena offers an array of arts, culture and entertainment options. By day, discover etchings by Rembrandt and Goya and a collection of Picasso graphics at the Norton Simon Museum of Art. Nearby, the Pasadena Museum of California Art showcases uniquely Californian art and design. If the kids are in tow, don't miss the Kidspace Children's Museum, including the hands-on Galvin Physics Forest. At night, enjoy music under the stars at the Levitt Pavilion Pasadena's free outdoor concert series. And if movies are more your speed, catch the latest blockbuster at iPic Cinemas. Old Pasadena offers an array of restaurants and cafes with an emphasis on alfresco dining. Fuel up for a day of shopping and entertainment with a cup of single origin coffee from Intelligentsia Pasadena Cafe or Crème de la Crêpe's namesake dish. If a midday sugar craving strikes, cool down at 21 Choices Frozen Yogurt or go Parisian at 'lette Macarons. For dinner, consider one of the Old Pasadena's many ethnic cuisines. Get a taste of the Mediterranean at Cafe Santorini, sample tapas at La Luna Negra or try a Himalayan dish at Tibet Nepal House Himalayan Cuisine. If you're craving traditional American fare, try a sophisticated meal at La Grande Orange or a/k/a An American Bistro's California cuisine. Want to get the full Old Pasadena dining experience? Try a three-hour culinary adventure with Melting Pot Food Tours. Whether you prefer checking out a live band, kicking back with a cold brew or cutting loose on the dance floor, there's something in Old Pasadena to keep you entertained from day to night. Sports fans can catch the game at Barney's Beanery, a Pasadena institution. Just down the street, craft brew enthusiasts can sample ales, lagers and stouts at Haven Gastropub & Brewery and Kings Row Gastropub. If you're looking to indulge in an upscale night out, pair sparkling wine with the souffle of the day at POP Champagne & Dessert Bar. And nearby, you're sure to find a bottle to love from Vertical Wine Bistro's selection of 650 wines. End the night on a high note at redwhite+bluezz, offering live jazz performances.